So here I am, after joking about how I am not really into sewing, and I decide to sew something. LOL I am a walking self-contradiction, to be sure. But to get technical...I really only dislike sewing with a machine. 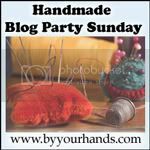 Crafty sewing is not too bad, and sometimes even fun! 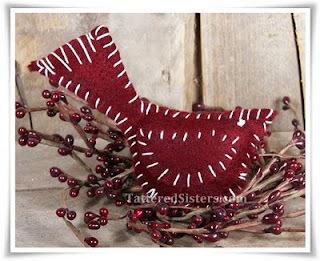 Anyway, I decided to make a Primitive Cardinal Ornie out of felt. Here's what I came up with. I'm always one to keep things as simple as possible (especially where sewing is concerned) and this could not have been much simpler. I just came up with a pattern, cut out 2 of the cardinal's body shape and 2 of the wing shapes. I stitched the wings on to each half of the body, and then stitched both halves on the body together (with long stitches on the tail to suggest tail feathers), leaving about 1/3 of it open for stuffing. After stuffing with fiberfill, I stitched the rest of the body closed. And then I finished it by creating a knot for an eye on both sides of the head. I love using felt for crafting, and I love how this turned out. Simple, sweet, and easy, just how I like it. It will be a nice addition to my collection of Primitive Ornies. And of course, this will work great on my Primitive Christmas tree too. But wait. There's more! I decided to create a pattern for the cardinal, in case anyone wants it. It's already in PDF format, all ready to download, just by clicking on the link below. Keep in mind, I'm not a professional at making Primitive Patterns...but I hope you can use it and have fun with it. You just need to cut two of each piece, stitch, stuff, and close! Super easy. You're welcome to use this pattern to make projects that you plan to sell, but please do not claim the image as your own or resell the pattern. 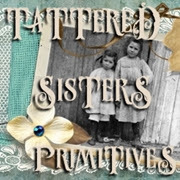 A link back to this post on Tattered Sisters would also be greatly appreciated.